We're pleased to announce that nominations have opened for our 2018 Secularist of the Year award. As religious fundamentalists become increasingly assertive and mainstream policy makers concede ground to them, this is an excellent chance to raise the profile of the often unsung heroes who stand for human rights, freedom and equality before the law. We have information on how to nominate people or groups and buy tickets for the awards luncheon below. Plans to merge a secular multi-academy trust and a Hindu one may create more "faith schools by stealth", the NSS has told the Government. The NSS has called for a new national entitlement for religion and belief education in England to ensure all pupils learn about a diversity of religious and non-religious worldviews. The NSS has written to the Government after a minister said Christian charities need not hide their faith when providing public services. The idea that secularism and human rights will inevitably establish themselves is "deeply complacent and apathetic," a report says. Campaigners say the Archbishop of Canterbury is being "evasive" and failing to offer "clear leadership" over clerical child abuse. The number of pupils being entered for an RS IGCSE exam which allows them to learn about only one religion rose by 40% last year. 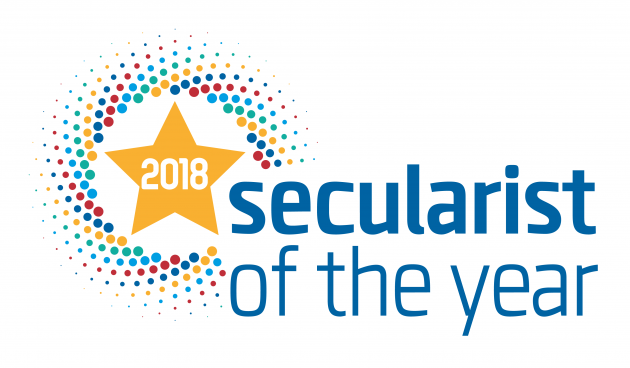 The National Secular Society has called on supporters to submit nominations for the 13th Secularist of the Year award. "It is repugnant to generally accepted standards of morality to require someone to lie, especially about matters so concerned with their protected human rights." "The Ofsted inspector said there has to be toilet rolls. We said there are always toilet rolls but they are not always out - so what?" Headteacher Abdul Ghafoor Salloo defends a Muslim girls' school's policy of not providing toilet paper for "cultural reasons"
"Stifling debate is dangerous. We know these ignorant or dangerous views exist, but if you ignore them they don't go away. They fester. People feel a sense of frustration that they don't have the freedom to express their views, which can lead to even more extreme views." "What a day, what a day for love, for equality, for respect." The hysteria of a cluster of conservative-minded activists to chase after liberal Muslims illustrates how they feel they have ownership of Islam, and they alone can define what it means to be a Muslim. Roy Moore has reframed his race for a Senate seat as 'God versus Everyone Else'. And despite allegations of sexual misconduct, evangelicals will back him out of tribal loyalty. An Egyptian woman rebelled against the radical Islamist ideas seeping into the mainstream of her society. Esraa has now left her job, moved apartments and been living in a state of total paralysis. Our campaigns officer Megan Manson discussed the secularisation of Christmas on the Chris Mann show on BBC Radio Cambridgeshire. Keith Porteous Wood, the NSS president, discussed a similar topic on Radio Essex. TES based a report on our concerns about the merger of a secular multi-academy trust with a Hindu one. And our research on Operation Christmas Child was mentioned in Third Force News. 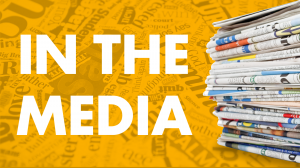 Keep on top of secularist issues with our daily collection of news and commentary from across the media, now available in your inbox. Click here to automatically subscribe, or subscribe online.